Write in the active voice, not the passive! You’ve probably heard this advice from some wise communicator types before — you know, like us. But how can you tell whether a sentence is active or passive? Well, dear readers, have we got the passive voice test for you! Just in time for Halloween, we present the Zombie Test, devised by Rebecca Johnson, PhD, from the Marine Corps University. How does it work? Just insert “by zombies” right after the verb in your sentence. If the sentence makes sense with this undead addition, it’s passive — and you probably want to revise it. If it doesn’t make sense when you add “by zombies,” you’ve got an active sentence on your hands. Behold the test in action. The epidemiologists reassured by zombies the fidgeting trick-or-treaters. That sentence doesn’t make sense with the added zombies, so it’s active. It’s already got a clear subject (the epidemiologist) who’s doing the action (reassuring), so you’re all set. But what about this? The form needs to be processed by zombies before the prescription can be dispensed by zombies. Who’s doing the processing and dispensing? There’s no subject! It’s passive! Run for your life! 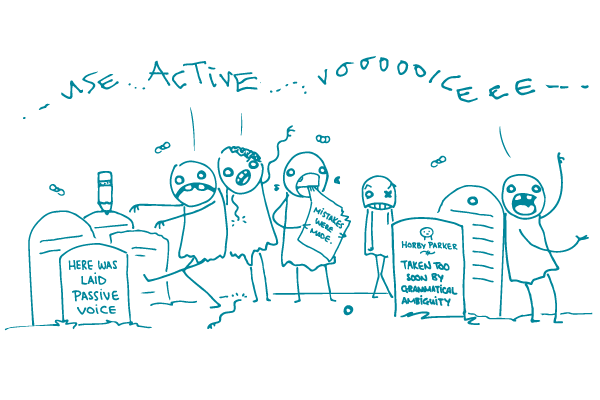 The bottom line: This Halloween (and every other day, too), zombies can help make sure you use the active voice in your writing.